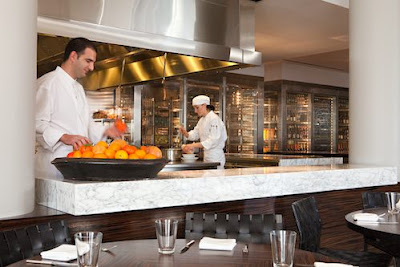 If it's not fresh, seasonal, and local, don't expect to find it on your plate at RH restaurant. RH, located in L.A.'s Andaz West Hollywood Hotel gets its abbreviated name from the term "Riot House" (the hotel's nickname from back in the '70s when memorable parties were thrown there by legendary rock stars). But, in my opinion, the letters RH could also stand for "Real Healthy" because everything you eat is centered around the market to table philosophy. Each day Executive Chef Sebastien Archambault goes out to the market and meets with farmers and fisherman, chooses the best of the best and brings it back to the kitchen where he and his culinary team create masterpieces. The food is Southwestern French with a California twist (fitting, since Archambault is California born and French-trained). 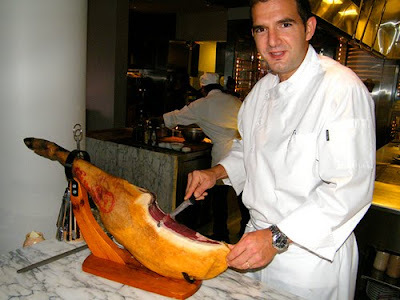 He also worked under French luminary Alain Ducasse and received a Michelin-Award for a restaurant he ran in Spain. 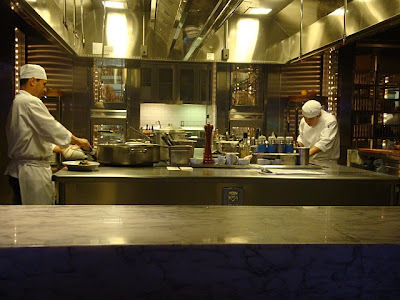 The kitchen is exhibition-style so you can watch your meal being prepared. In fact, everything at RH is on display - including the fresh seasonal ingredients inside of the glass enclosed refrigerators beyond the kitchen. The restaurant is a wide open space with a bar and views of busy Sunset Boulevard. 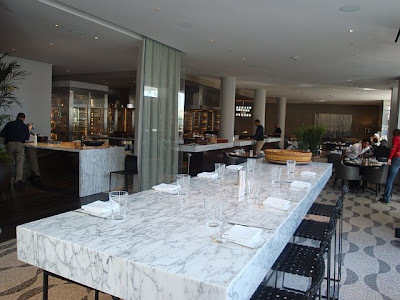 The decor of RH is clean and sleek with two long marble communal tables as you enter the restaurant, and smaller wood tables once inside. 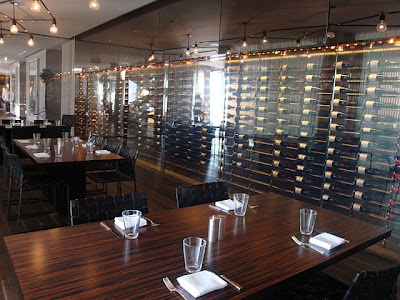 You also can't help but notice their fabulous wine collection on display in their see-thru cellar which lines you on either side of the restaurant. Speaking of the wine, their wine list features mostly California wines with a few from France (and, for a restaurant of this caliber, very reasonably priced). 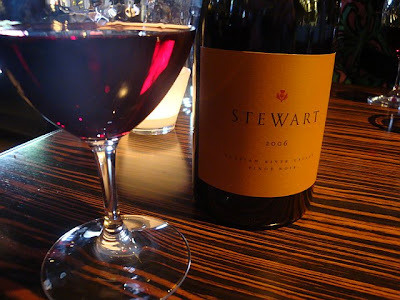 We ordered a bottle of their Stewart 2006 Pinot Noir from the Russian River Valley area of California. It was both fruity and spicy and medium bodied...just perfect for what we were about to eat. The cost- $60 (and that was slightly more expensive than other bottles on the menu). Now to the incredible food...following RH's market to table philosophy, your meal begins with a plate of fresh vegetables. This includes tri-color carrots, purple cauliflower, radishes and cherry tomatoes (produce you don't often see in New York). 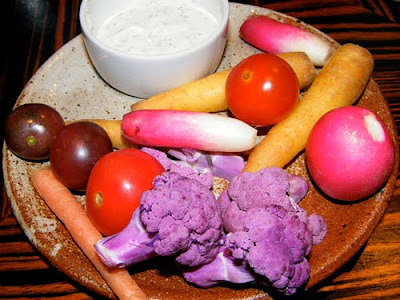 The crudite is served with a sweet, yet tangy, yogurt dip with fresh mint. I ordered the Perigord Tourrain soup (traditional chicken veloute with garlic and egg whites)which came highly recommended by the staff. 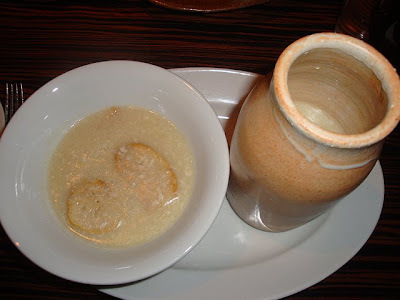 It reminded me of traditional egg drop soup, but was much richer and creamier. The soup is topped with small crostinis which give it a nice crunchy bite. 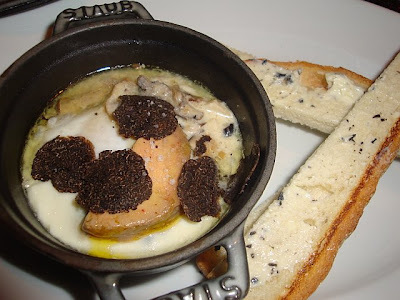 My husband, Rich, started with the Perigourdine poached egg with field mushrooms, foie gras and black truffle appetizer - a brilliant combination of simple and exotic flavors that is impossible to describe and utterly amazing. 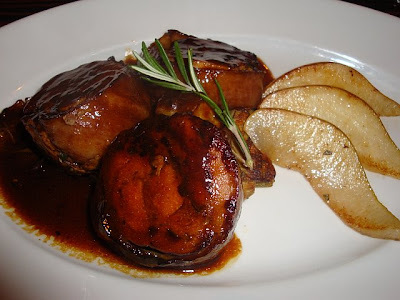 For my entree, I tried the 12-hour cooked boneless suckling pig with artichokes and rosemary jus. Because the meat is cooked for so long and at a low temperature, it was nice and tender and it felt like it was melting in my mouth. The rosemary gave it a nice earthy flavor, not at all overpowering the dish, and the artichokes added the right amount of texture to the dish. The sliced pears on the side were the perfect sweet accompaniment to go along with every bite you take of the pork. This dish was superb! 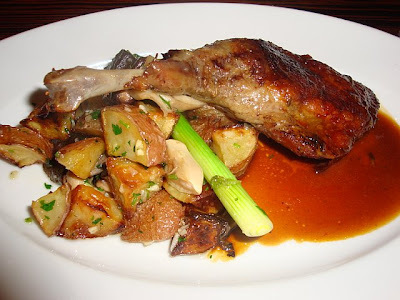 Rich ordered the homemade crispy hudson valley duck leg confit with sauteed potatoes, green onion, garlic and parsley. Another winner, this dish was perfectly cooked and balanced. 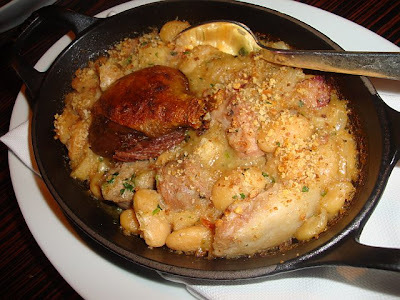 Chef Archambault surprised us with his Cassoulet with duck confit. Everyone had talked about this dish when we were trying to decide what to order, and boy we were glad we got to try it. It's a traditional dish from Southern France described to us as something "your grandma would have made for you" (if you were lucky enough to grow up in the South of France). It has beans, sausage, bacon and duck confit and is topped with bread crumbs to give it a nice crunchy top. This is comfort food at its best! 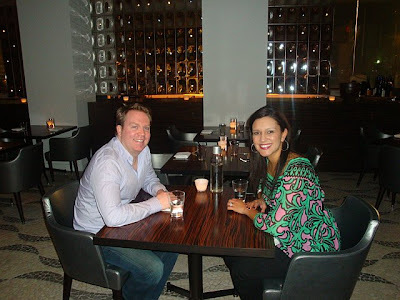 Warm, friendly, informative, service- in an elegant, yet relaxed way- rounded out a divine dining experience. Everything was amazing! Love your food pictures. This place looks and sounds great. Will check out next time I'm in L.A. for work which should be next month. Thanks! Glad you like the pics! I'll tell you what...they don't even do the food justice, that's how good RH is...definitely check it out if you can. Thanks for reading! I agree the pics are great. I don't know much about gourmet food,but they all sound very good and I would definitely give them and the restaurant a try if I ever get to LA. The Chef sounds like he puts a lot of pride into his dishes which is always a great thing. Looks like you and Rich had a great time and ate some delicious food. Too bad you didn't bring me a doggie bag!